12 I Can Dream, Can't It? 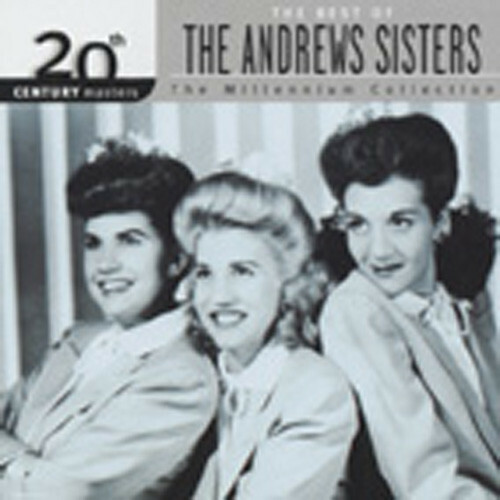 The Andrews Sisters, who were of Norwegian-Greek descent, were born in Minneapolis, in the state of Minnesota. In their youth, Patti had been a tap-dancing champion, and LaVerne had seriously considered a career as a concert pianist, but it was Maxene who saw the possibili-ties of the three of them singing together, for their harmonizing together at school events had been very well received. So when bandleader Larry Rich, having seen them perform at a Kiddie Revue, offered them a job, they immediately grabbed it. Patti was 12, Maxene 14, and LaVerne 17, when they began with Rich on what turned out to be a tour of vaudeville theaters that covered the whole of the United States. However, the arrival of talking pictures proved to be the death-knell for vaude-ville, but somehow the sisters managed to get through two years of touring on their own. It was a long hard slog, with many disappointments along the way, but they never gave up hope at any time and kept knocking on the doors of agents, directors and producers, in spite of there being a deep economic depression in full spate. They sang in hotels with Leon Belasco's orchestra (with whom they made their very first recording), before moving into the club and theater circuit, and it wasn't long before radio offers came their way, which led to recordings being made, which in turn led to their being more in demand than ever. Thereafter, their life became a busy succession of radio, night club and theater engagements. Then motion pictures made a claim on them, and over an eight-year period they appeared in well over a dozen movies, including an appearance in one of the most popular of all the Bob Hope-Bing Crosby-Dorothy Lamour Road' films, "Road to Rio". Meanwhile their recordings produced one big hit after another. They are probably the most famous sisters-act the world of show-business and popular entertainment has ever known, for only the four King Sisters spring to mind as having been anyt-hing remotely similar, and the Dolly Sisters were from a totally different era entirely. Patti, Maxene and LaVerne Andrews together made an extraordinarily successful singing trio, and their time' could best be said to have dated from 1937, the year when their huge hit "Bei Mir Bist Do Schoen" had propelled them into instant popularity. The song made them, and they made the song. Their particular brand of showmanship was considered somewhat brash at the time, but which was nevertheless highly effective on novelty or jazzy' numbers. They certainly sang well in harmony, and achieved a particularly tasteful blend on ballads. Patti, the blonde one, sang lead and solo, and with her very agreeable personality also acted as spokesperson for the trio. The Second World War found them probably at the height of their fame, and apart from their own big wartime hits such as, for example, "Rum and Coca Cola", "Boogie Woogie Bugle Boy" and "Don't Sit Under The Apple Tree", they also combined with the Old Groaner hinself, Bing Crosby, on other mission-sellter such as "Pistol Packin' Momma and "Don't Fence Me In"
Kundenbewertungen für "20th Century Masters - The Millenium Collecti"